My iPhone Cable Is Hot! Can A Hot Cable Cause Damage? You are at:Home»iPhone»My iPhone Cable Is Hot! Can A Hot Lightning Cable Cause Damage? My iPhone Cable Is Hot! Can A Hot Lightning Cable Cause Damage? Ouch! Your iPhone cable is hot to the touch. What do you do? Can a hot iPhone cable damage your iPhone? 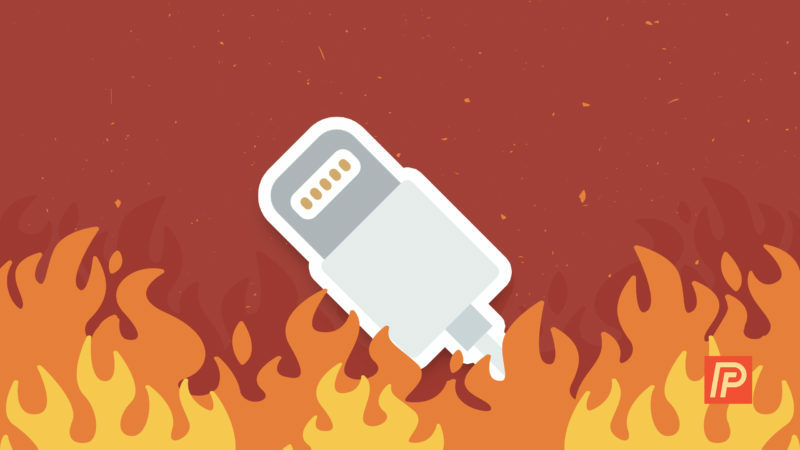 What happens inside your iPhone when the USB cable starts overheating? 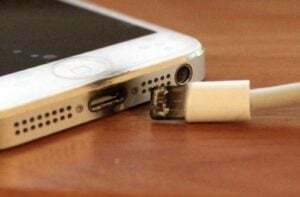 In this article, we’ll discuss the reasons why good lightning cables go bad and debunk the myths about what can happen when your iPhone cable gets hot. I saw cables in all conditions as an Apple technician. We use our iPhone cables in all sorts of environments. New puppies, kids, the weather, and a plethora of other causes and conditions lead to some pretty mangled cables. It’s not always someone else’s fault – sometimes cables just, well, break. Among all the types of damage I saw, the most common was a frayed cable near the end that connects to your iPhone. I also saw plenty of cables like Uwais described in his question, with a bulge at the end. Why Do Lightning Cables Bulge When They Overheat? Bulging at the end of a lightning cable is typically caused by a short circuit inside of the rubber housing at the end of the cable that connects to your iPhone. Due to the short, the cable overheats on the inside, the plastic surrounding the short warps, and the overheated plastic causes a bulge to form at the end of the cable. Can A Frayed Or Bulging iPhone Cable Harm My iPhone? In short (pardon the obvious pun), no – except one condition I’ll discuss in a moment. It’s only in the rarest of occasions a defective cable can harm an iPhone. That’s because your iPhone’s charging port is quite resilient to all but water damage, and when the cable shorts out, it does so inside of the cable, removed from the iPhone itself. A Short? Can’t That Fry My iPhone? When people hear “short”, it’s easy to imagine a huge amount of electricity zapping your iPhone’s logic board and the whole thing going up in smoke. If your iPhone were plugged directly into the wall, this might be a possibility – but it isn’t. Remember that the amount of power flowing into an iPhone isn’t regulated by the cable, but by the 5 volt power adapter connected to the wall or the USB port on your computer (also 5V). The cable can short out all it wants, but it’s impossible for it to deliver any excess charge that might “zap” your iPhone. What’s The Exception To The Rule? There is one exception where an iPhone USB cable can cause damage to your iPhone, but it has nothing to do with the cable. Customers often brought me iPhones with signs of scorching in and around their iPhone’s charging port. In every case, close examination revealed corrosion inside the port. The exception is this: If your iPhone is water-damaged, then any USB cable, defective or otherwise, can damage your iPhone. That’s because the short now occurs not in the lightning cable, but inside of the iPhone itself. When the inside of the iPhone overheats, it causes damage to the battery, and the chemical reaction that takes place when an iPhone battery overheats can be all but explosive. As an aside, all Apple genius rooms have a little firebox inside of them – if an iPhone or Mac battery is overheating, throw it in the box and shut the door! (In all my time at Apple, I never had to do this). What’s The Verdict? Can A Defective Cable Actually Damage My iPhone? I never saw it. When an iPhone cable overheats, it does so inside of the cable, too far away from the iPhone to cause any real damage. The only exception, as we discussed, is when the lightning cable overheats inside your iPhone, in which case it’s really not the cable’s fault at all, even if it may appear to be. If it’s your iPhone that gets hot, it could be another issue entirely. Check out my article, “Why Does My iPhone Get Hot?” to learn more. Don’t get me wrong: I’m certainly not saying that people with defective cables should continue using them indefinitely. If you want a great lightning cable for less than half the cost of Apple’s, check out these AmazonBasics lightning cables. You wouldn’t want the cable to continuously overheat and burn you or something else. But damage your iPhone? I think not. Previous ArticleWhy Is My iPhone Black And White? Here’s The Real Fix! Next Article My Responsive Website Isn’t Working. The Fix: Viewport.